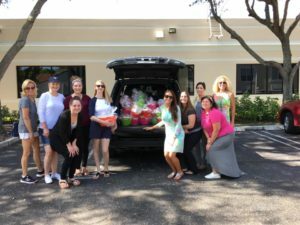 Pink Palm was created to help make various local nonprofit organizations life a little easier by supplying care packages filled with life’s necessities for those in need. Hundreds of care packages are created by JLPB volunteers each year. New residents to Vita Nova and Nelle Smith receive a comforter, sheets, a towel set, pillow, cleaning supplies, personal hygiene supplies, hangers all packaged in a laundry basket. All the things our parents sent us out of the nest with we give to these young adults as they start a new phase of their life. Other organizations receive similar items, but are changed based on need – blankets and formula for premature babies, nutritious snacks for Opportunity Inc, school supplies for PACE, etc. How you can help: Do you own/know a business that could help to provide items at a low cost? Would you like to donate items for the next basket build? Please see our wish list for items we are in need of or you can contact us at pinkpalm@jlpb.org.